The engravers' signatures discussed in this book were inscribed over a thousand years ago on the metal surfaces of coin dies which measured no more than three and half centimetres in diameter. Although not a single signed die has survived to the present day, a small number of the many thousands of coins made from them remain in coin collections all over the world. What do these tiny marks have to tell us about the early medieval Islamic world? 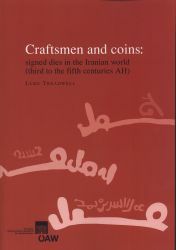 In fact they tell us a great deal about the working lives of two metalworking craftsmen, Mujib and ?asan, who made dies for mints in Afghanistan and Iran (293/905 to the 360s/970s). The signatures allow us to identify a number of dirham dies that can be attributed to each engraver. By comparing the style of these signed dies with unsigned dies of the same period we can build up a corpus of objects that can be attributed to each craftsman. The die corpus provides a pool of evidence upon which to base a detailed study of the engraver's working practices. It allows us to see how he manufactured these objects, what kind of tools he used, the styles of script he chose and even the mistakes he occasionally made. Our engravers' working environment was very different to that of the caliphal period which preceded it. When the unitary caliphal state fragmented into numerous successor state polities, the highly regulated centralised caliphal die workshop disappeared. Since there were no trained dirham die engravers in the successor states, the new rulers were forced to employ craftsmen who had learned their profession as metalworkers or gemcutters in the bazaar, whence they brought their signing practice into the mint. The signing phenomenon, though short-lived, illustrates the momentous changes caused by the collapse of the caliphal monetary system.